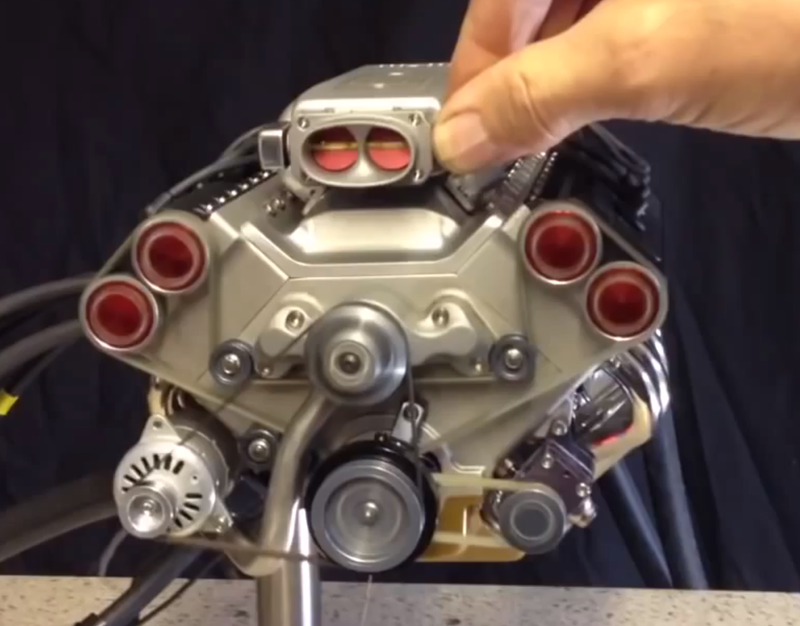 A few months ago we mentioned [Keith]’s first project in the works, a 1/4 scale V8 engine. Today, we are amazed to see that his engine is finished and running really smoothly. What is even more impressive is that the entire project has been completed on manual mills and lathes. The thread on the Home Model Engine Machinist forum contains his build log in which he details how all the different parts were made. The engine has an electric starter, uses a fuel injection system and [Keith] even made his own injection molds for several plastic parts. The ECU is based on the Megasquirt-II, we guess it must have taken [Keith] many tries before correctly setting its parameters. A video of the engine in action can be viewed after the break. You can find our previous coverage of this project as well as other miniature engines on this feature from last April. Very cool. Gotta love a mini engine. Evidently the builder is some sort of cyborg, because seems superhuman. first engine project, not actual first project. I would love to see that engine used to power a large R/C truck. This may be the coolest build I’ve ever seen. Fscking BRAVO. Could this thing be installed into a go-cart (and provide enough power to be useful) ? How cool would it be to be able to say you’ve got a 8v go-cart? Doesn’t look like it has much of a cooling system, so if you tried to get much power out of it it or even run it at idle too long it would probably overheat. Cool then. It would be fun to have a light scooter with such a deep engine sound. It’s too small for a go-kart. 49cc is just right for a moped, though. It will still be slow, but at least you can have fun revving it at stoplights. Go-karts? Mopeds? Forget that! I want a V8 powered chainsaw! Then again, some twit would probably reckon that a 4 cylinder one is more efficient in city traffic. Wow – those guys with the huge chainsaws are either really brave or really stupid. Can just imagine that conversation – No Billybub, you just hold the other side, I’ll rev the hell out of the motor, and we’ll both lean in and put all our weight on it while the chain is running just about a foot from our huge beer guts – it’s be fun, what could possible go wrong? Awesome project! BUT!!!! Megasquirt was not, is not, and probably will never be opensource! Just read thru his thread. It’s amazing. All manual machining and he even made his own spark plugs and hose fittings. His second project, by the way, is going to be a 1/3-scale V-10. Wish he was doing a V-12! W-24 while we’re at it! The MegaSquirt series of ECUs are absolutely NOT “open source” by any definition. They’re commercial, proprietary, and owe much of their success to the efforts and contributions of people who misunderstood this fact. I strongly recommend the editor correct the title as it’s entirely misleading. did not know this, i left the megasquirt scene before the MSII “cpu” came out and back then all the source was avaliable to play with, and fantastic support forums. will be deeply dissapointed if thats no longer the case :( Was my first experience of coding assembly and learned a lot. It’s still available, but due to the licensing any modifications to the code become the property of Bowling & Grippo. The code can also only be used on licensed B&G hardware. Well, as far as I know ms is or att least was “open source” by at least some defintions. This is the problem with using the “OSS”-term when you more specifically mean FOSS (by fsf defintion). “open source software” is a usable term, but it is, in my opinion, a bit vague when talking about the differences between the ms licens and what fsf would call free. The term free open source software is less vague as the fsf defintion is used by most (but not all, it is allways someone that has a defintion that only include mit/bsd-style licenses…). That said, I don’t like the ms licens, and I think it should always mention the restrictions when if you want to call it oss. But I do like that engine :). Beautiful. That is some dam fine engineering. Fantastic, I love projects like this. Would be amazing to see what this thing could do scaled up a bit. Go kart or v8 garden tractor perhaps. SHRINK RAY IN THE GARAGE! Diana Prince is going to be so-o-o-o pissed! You do know that she is actually Wonder Woman? Wel-l-L-L-L, DON’T YOU? DEEP DOO DOO DOESN’T BEGIN TO EXPLAIN JUST HOW MUCH TROUBLE YOU’RE IN! And I will, just before I get on THE PLANE TO NOWHERE!!! Just perfect for a superscoot or goped. That just needs to be put into an RC or someone make a 1/4 scale ride-on car for a child.